There are two certainties if you have morning shift for HSA at Kara Tepe. The first is that the water pressure to fill the chai pot will be different from the day before. The second is that, if you sit down, Shahab will crawl into your lap. 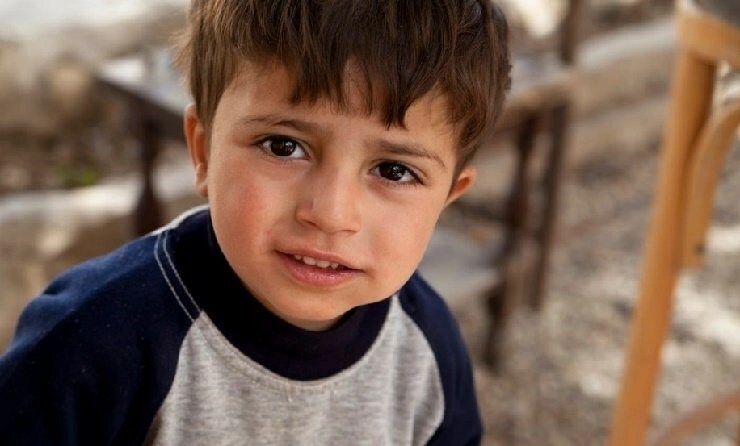 Shahab is a five-year-old Yazidi boy from Iraq who is one of the camp’s early risers. He is a Curious George of sorts, and camp mascot. He has picked up phrases in several language, all of which he says with no discernible accent. Swiss volunteer Janos Winkler declared him the cleverest boy he has ever met. He also gets under foot like a rock in your shoe, but the rock’s eyes don’t smile with as much cuteness to make you forget the annoyance. I don’t know which of the languages Shahab is learning will be the one he speaks as an adult. I don’t know which country those intensely alert eyes will look upon. And I don’t know if he will ever see his native Iraq again. Yesterday I stayed late after my shift because Mohammed, Maisun and family are heading to Athens today and asked me to dinner. They said come at 4pm (we ate at 8pm…) and Maisun taught me to roll grape leaves. She had parboiled rice and added tomatoes, onions and parsley and soaked the grape leaves (which she found growing outside the camp) and, once what seemed like a thousand were rolled, tied them in bundles of twenty or so and put them in a pot topped off with sliced tomatoes and more grape leaves. Add water and boil for another 30-45 minutes and wow. Meanwhile, with a deft hand that needed no cutting board, she made a salad of chopped tomatoes, cucumbers and other vegetables grown in an impromptu garden in front of their RHU. They have been here four months, and Mohammed is skeptical of the process at Athens, and worried about many things. He worries that his kids are getting a bit wild after four months in camp, harder to control. He laments their loss of a school year, not only what they aren’t learning, but what they may be forgetting. He has three daughters ages 8, 6, and 4, to whom he, tongue-in-cheek, refers as Scream 1, Scream 2 and Scream 3. He and Maisun also have a boy who thinks every male volunteer is his personal punching bag and jungle gym. Mohammed says that he has heard that most Syrian refugees end up staying in Greece and not moving on. He has no idea what country he would rather be in, but Greece is in the throes of a financial crisis and work prospects are not good. He can boast a resume that includes a degree in archaeology, experience as a plumber and electrician as well as a stint working in a plastic bag factory. Yet even so, he knows he will be at the bottom of an already rickety employment ladder. It made me think of other immigrations and other homecomings. Of my wife’s grandfather Ramón Caamaño (simplified to “Camano” in the US) who returned for a visit to Spain after decades in the US, and died in the taxi as it entered his hometown of Carnota, Galicia, possibly from the shock of change or the mere anticipation of it. Of my own Grandma Mul’s return to Clifden, County Galway, after more than half a century away, and her brother Patrick, who never left, greeting her, “How have you been, Kathleen? Let’s share a pint.” Who helped them along on their own journey of emigration? Were there strangers we never heard about, acts of kindness on Ellis Island or upon their arrival to New York? Were there struggles we never heard of, and sufferings buried deep, seen only in the reflection of a silent stare into a glass of whiskey? And those departures were not induced by the bombs of terrorists. Maisun has 10 siblings, all scattered now between Syria, where her parents still live, and points abroad, at different stages of their journey. Any future family reunion looks impossible. Her brother-in-law, barely 30 years old, was walking home from work and was killed by a bomb in a market. Her brother’s wife had a breakdown and left her children, now in the care of Maisun’s parents. The ripple effect of terror is heinously wide-reaching. Families lament the absence of loved ones with the phantom pains of an amputee. Before my shift tonight I will surprise Mohammed and Maisun to say farewell at the port. Even if they return to Kara Tepe, I will have departed for my own homecoming. As for Shahab, he lives his life like a child in a game, like the boy in “Life is Beautiful,” who is safeguarded from horror by the adamantine shield of innocence and parental love. Will there ever be a homecoming for him? Will he have roots enough anywhere to tell stories to his grandkids, and make them long to visit Iraq like Grandma Mul made me long for Ireland? He has already lost his home. It is a duty incumbent upon every person he meets to stave off the further and ultimate deprivation of losing the idea of home.